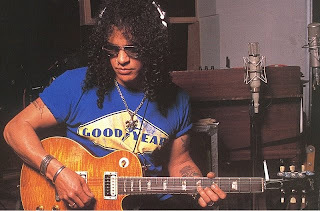 I just came across a tribute site to Kris Derrig, ghostbuilder of the famed Les Paul replica which Slash used extensively on Appetite For Destruction. There was a time in the mid to late-80's when Floyd Rose-equipped super-strats were the de facto standard. It was also a time when Gibson's production quality was, arguably, at its lowest, paving the way for several private guitar builders to start building high quality Les Paul replicas for a small but discerning clientele. These Les Paul replicas were physically identical to the originals, Gibson logo and all, and flying under the radar just enough to not be noticed by Gibson's lawyers. The more famous of these builders were Kris Derrig and Max Baranet, and across the pond in the UK, Sid Poole. While Gibson strayed from their original specifications and cut corners in quality, these ghostbuilders started adding their own little improvements in terms of neck pitch, headstock angle, the use of more exotic woods and better overall construction. The late Sid Poole began adding sonic chambers under the highly-figured tops of his Les Pauls, lending his guitars an airy, resonant quality -- a concept that Gibson themselves were to adopt later on. Kris Derrig and Max Baranet became known for building the replicas that Slash was to acquire. The huge success of Guns N' Roses 1987 debut Appetite For Destruction -- replete with the creamy, sustaining tones of the Derrig Les Paul replica -- led to a tremendous resurgence in the popularity of the Les Paul. It's ironic that the very guitar that helped make Gibson popular again was not made by Gibson at all! www.KrisDerrig.com appears to be still in its infancy. And I'm not sure if its meant entirely to be a tribute site dedicated to Kris Derrig as there is also a fair amount of detail on the site about Max Baranet's work. I'm bookmarking this one to see how it develops. It's been a tribute site to Kris for his mother and remaining family. I've never seen anything for sale on the site ever since the site went up in 2006. Some info went up there about Max a while back to set the record straight between the 2 guys. It seems that Max had taken the credit for Kris's guitar that Slash used on AFD album back in the 90's and it seems the author tried to resolve that in the timeline. I think it's about time the guy got some credit for his work.